Hey there! Welcome to episode 119 of the Curve the Cube podcast. I can’t believe it’s already episode 119. Thank you so much for being a listener and coming along on this journey with me. I hope you are becoming more and more of a curvist yourself, too!! This episode features a girl I am sooo excited to introduce you to, in case you don’t know her, yet. She’s Yamilia Avendano, a.k.a. Yami, and she founded her uber successful video game press site, Twinfinite.net, about 6 years ago. We sat down right on the heels of her coming back from E3 and had SUCH a fun time! She may seem unassuming and even a bit shy. But, don’t let her fool you. She is a force to be reckoned with, and there’s simply no stopping her rise to the top! On this episode we talk about how she gets creative with her video series, whether turning your passion into a career makes it feel like a job, feeling you need to do it all (but, for everyone else), and of COURSE, some of her E3 reviews. In a bit of a formatting toss-up (I warned you I would be playing a bit with the show’s format for a few episodes here and there), I will be diving deep into the whole passion-feeling-like-a-job issue in a mini-solocast before then taking the topic to The Learning Curve. AND, you will be treated to a quick sneak appearance by one of my new favorite people, Glenn the Geek of the Horse Radio Network! 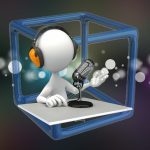 So, just a couple of quick reminders: Please check out all the shows on the Flint Stone Media Podcast Network by going to FSMPodcastNetwork.com. And, join the conversation on Facebook the the Dreamers Become Doers group. Head to DreamersBecomeDoers.com for all the info! Alrighty, let’s get into the conversation with Yami of Twinfinite.net, already! And, I apologize in advance for my massive case of the giggles!! Interested in podcasting? Head to Libsyn.com and use my promo code “IGNITE” to get one month of free hosting with the BEST hosting company around–Liberated Syndication!